Leeds United came from behind to stretch their lead at the top of the Sky Bet Championship with a hard fought 2-1 victory at Rotherham United at the New York Stadium. 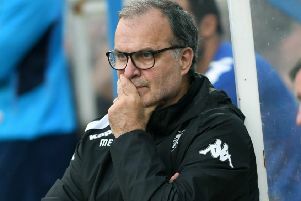 Marcelo Bielsa’s men looked in danger of a fifth defeat in six games as they trailed at half-time to a stunning strike by Semi Ajayi. But a strong response after the break saw midfielder Mateusz Klich strike twice to earn a win that took Leeds three points ahead of Norwich in the table and six points ahead of third-placed Sheffield United. Leeds had Kalvin Phillips back after suspension at centre-back and had goalkeeper Kiko Casilla in for his debut in goal. They almost made a flying start as in the second minute Jack Harrison raced onto a long ball by Liam Cooper and saw his cross flicked on by Kemar Roofe, but the ball was cleared. It was hard work from this point as the passing was short of the required standard and a competitive Rotherham side ensured there was little space to attack into. The hosts also found it hard to get forward in numbers and a dour first 25 minutes was played out with no sign of a goal. It was right out of the blue when Rotherham took the lead as a better build-up put Semi Ajayi in space and he rifled in a 25-yard shot that gave Casilla no chance. The goal was what the game needed as Leeds suddenly looked livelier and fashioned their first serious effort with Jack Clarke heading well wide. 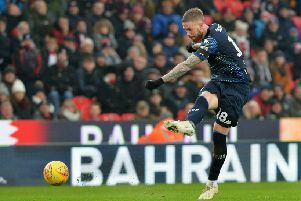 A dangerous Luke Ayling cross was well cleared at the back post with Clarke lurking and the resulting corner was headed wide by Ezgjan Alioski. Leeds managed their first effort on target in the 44th minute when Harrison’s well struck low shot was held by home keeper Marek Rodak after a swift break from half-way. There were definite signs of improvement, but the break came with the home team ahead. Head coach Marcelo Bielsa responded to the flat first half by bringing on Tyler Roberts for Clarke, who had endured his first poor 45 minutes in a Leeds shirt. He got the response he wanted, but not in the way expected as Mateusz Klich chased Hernandez’s ball into the box and as he challenged defender the ball somehow ended up bobbling into the net. Suddenly Leeds got right on top as Phillips’ header from a corner was comfortably saved, Pablo Hernandez saw a free-kick blocked and Klich sent a shot over from the edge of the box after some strong pressure. Rotherham responded with Will Vaulks bringing a flying save out of Casilla with a strike from distance. At the other end Kemar Roofe should have done better as he got on the end of Hernandez’s lovely little chip over the home defence, but headed wide with just the keeper to beat. Alioski then put another chance wide after finding himself free in the box and not realising he had more time to pick his spot. Leeds finally got the second goal they deserved four minutes from time after Harrison came up with a good run and pass into the area, finding Klich who calmly made space before stroking the ball into the bottom corner of the net for his first goal for some time. There were a few nervy moments to ensure in almost seven minutes of added time, but Leeds saw the game out for a vital three points. Bielsa stressed the importance of the victory. He said: “We had the ball, but didn’t create in the first half. But in the second half it changed, we attacked better and had chances to score. “The first goal had a positive impact on the team. Rotherham: Rodak, Jones, Raggett, Ajayi, Robertson, Mattock, Vaulks, Towell (Crooks 85), Forde, Taylor (Yates 75), Smith (Vassell 82). Leeds: Casilla, Ayling, Phillips, Cooper, Alioski, Forshaw, Clarke (Roberts 45), Klich, Hernandez (Davis 90+5), Harrison (Shackleton 87), Roofe.